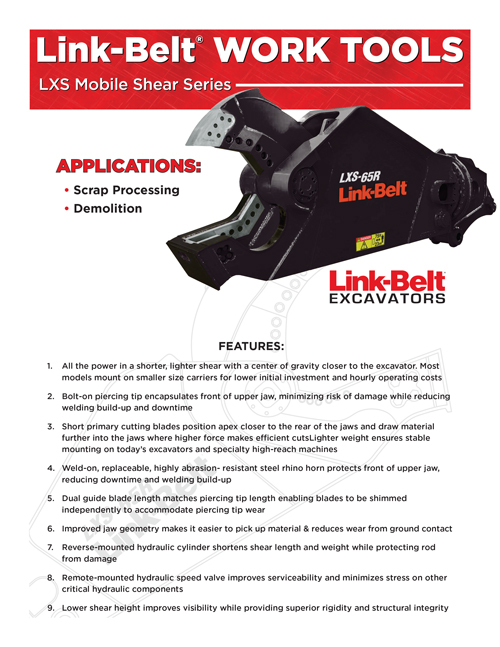 Link-Belt LXS Mobile Shear work tools (LXS Series) handle a variety of scrap processing and demolition applications. Engineered to fit on smaller carriers, these high-efficiency units deliver maximum power and efficiency. Redesigned jaw geometry makes it easier to pick up material and reduces wear from ground contact. Choose from a wide selection of boom or stick-mount configurations, in sizes to fit Link-Belt 210 through 750 machines. All the power in a shorter, lighter shear with a center of gravity closer to the excavator. Most models mount on smaller size carriers for lower initial investment and hourly operating costs. Stick Mount** Minimum Excavator Wt. (2 223 kg) 18 in. (2 948 kg) 23 in. LXS 35R 3 7,300 lbs. (3 311 kg) 23 in. (4 309 kg) 28 in. (4 990 kg) 28 in. (5 262 kg) 30 in. (5 942 kg) 30 in. (5 987 kg) 32 in. (6 668 kg) 32 in. (7 031 kg) 35 in. LXS 75R 3 17,750 lbs. (8 051 kg) 35 in. (8 165 kg) 39 in. (9 072 kg) 39 in. (10 433 kg) 44 in. **2nd-member installations that are at or near minimum excavator weight and all 3rd-member installations require pre-approval from LBX. 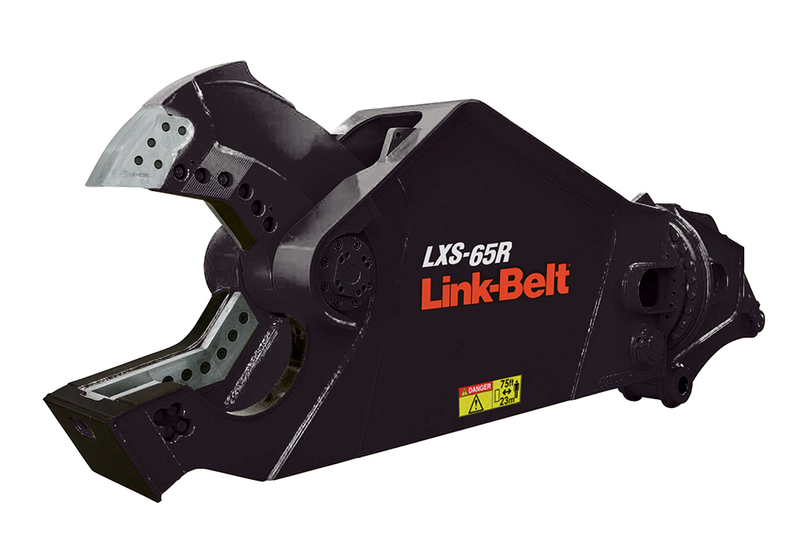 All LXS tools are covered by a 1-year, 1,800-hour (whichever occurs first) Standard Limited Warranty; warranty will be honored on tools mounted on Link-Belt excavators only.